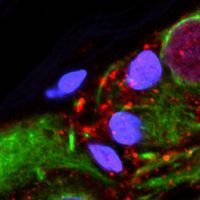 Even when Parkinson’s patients don’t have mutations in a gene called LRRK2, more of the active enzyme the gene generates is present in their brains than in healthy brains, researchers reported last week (July 25) in Science Translational Medicine. The finding suggests that LRRK2 inhibitors could help to reduce harmful effects of the enzyme in the vast majority of Parkinson’s patients. “This is the really interesting bit of data … the demonstration that when you look in the brains of individuals with idiopathic Parkinson’s [where the cause is unknown], that there’s evidence that LRRK2 is activated,” says Patrick Lewis, who studies Parkinson’s disease at University College London and the University of Reading in the UK. He has collaborated with one of the paper’s coauthors but was not involved in this study. Ten percent of Parkinson’s cases have known genetic causes. Three percent of cases are due to a mutation in LRRK2, the gene encoding the LRRK2 enzyme. 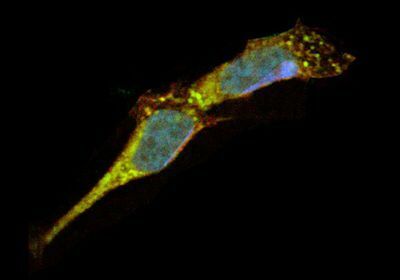 The enzyme is highly active in Parkinson’s patients with a mutated LRRK2 gene, and the increased enzyme activity has been linked to the development of the disease. In the new study, Timothy Greenamyre, a professor of neurology at the University of Pittsburgh, and his team wanted to look at the level of active LRRK2 in patients without an LRRK2 mutation. “Because [LRRK2] is a low-abundance protein, people have had difficulty detecting it,” Greenamyre says. To spot active LRRK2, the researchers first developed two versions of an assay: the first detects the active enzyme and the second, the inactive enzyme. In the first detection method, researchers used two different antibodies, one that binds to a specific subunit that acts as a known indicator of the active enzyme and another that binds to a different proximal portion of it. When both antibodies bind successfully, their close contact generates a fluorescent signal—a sign of active LRRK2. The second method detects a protein known to regulate LRRK2 activity. Higher levels of this protein indicate lower levels of available active LRRK2. 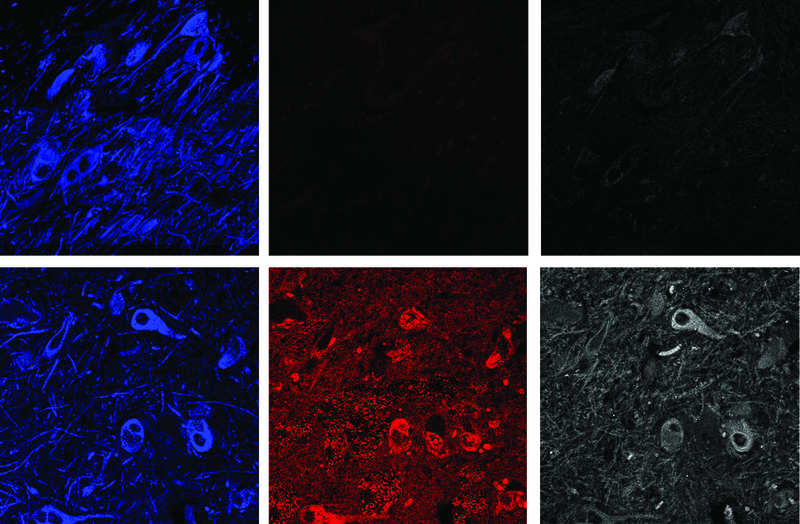 Dopamine neurons in Parkinson's patients' brains show higher levels of active LRRK2 (bottom, in red and gray) compared to healthy brains (top). The team used the assay on postmortem brain tissue from Parkinson’s disease patients and from healthy individuals. 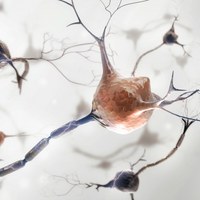 The researchers observed higher levels of the active LRRK2 enzyme in substantia nigra dopamine-producing neurons—the death of which indicate neurodegenerative disease—in the brain tissue of Parkinson’s patients’ with no mutation in the LRRK2 gene than in healthy brain tissue. “We have been wondering for a very long time whether LRRK2 plays a role in sporadic Parkinson’s disease,” says Mark Cookson, who studies the neurodegenerative disorder in the National Institutes of Health’s Laboratory of Neurogenetics. He has collaborated with Greenamyre before but was not involved in this work. According to Cookson, this study provides “definitive evidence” of LRRK2’s role in the disease, even in patients without a mutation in the gene. In the next set of experiments, Greenamyre and his colleagues wanted to see if active LRRK2 turned up in two rat models of Parkinson’s disease. In the first rodent model, the animals were given the toxin rotenone to induce symptoms of the disease. Even without a mutation in the LRRK2 gene, the rats had higher levels of active LRRK2 protein. In the rats’ brains, the active LRRK2 enzymes were linked with clumps of another protein, α-synuclein. The clumps eventually help form Lewy bodies, a characteristic feature of Parkinson’s brains. In the second rodent model, the researchers overexpressed wildtype α-synuclein in the rats’ substantia nigra, which caused levels of active LRRK2 to rise. When the group treated the rotenone-rodent model with a drug that inhibited the LRRK2 protein, the number of clumps and Lewy bodies dropped. The team also observed higher levels of reactive oxygen species (ROS)—chemically responsive molecules such as peroxides—in the brains of both rat models of Parkinson’s disease. As a result, Greenamyre and his colleagues wanted to see if directly increasing ROS led to more active LRRK2. In a third set of experiments, the team dosed healthy human cell lines with hydrogen peroxide and found the addition of the ROS increased the levels of LRRK2. A spike in ROS levels, the researchers suggest, activates LRRK2, which in turn aids in the development of some classic Parkinson’s features. Blocking the production of ROS resulted in a drop in active LRRK2. 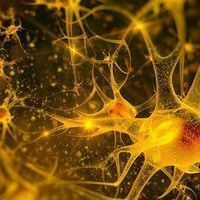 The result gives clues to an environmental cause for Parkinson's disease. Pharmaceutical companies are already developing LRRK2 inhibitors that can help the small percentage of Parkinson’s patients that have a mutation in the LRRK2 gene. “The inhibitors may benefit patients not only with the mutation but also patients who have idiopathic diseases—they’re much more common,” says coauthor Dario Alessi, a professor who studies signaling pathways in neurodegenerative disorders at the University of Dundee in the UK. LRRK2 inhibitors, the researchers note, cause mild, yet reversible side effects, in the lungs and kidneys. R.D. Maio et al., “LRRK2 activation in idiopathic Parkinson’s disease,” Science Translational Medicine, doi:10.1126/scitranslmed.aar5429, 2018. Correction (August 7): The story erroneously quoted Mark Cookson as having said "defensive evidence," when he said, "definitive evidence." The Scientist regrets the error.